It's been a good long while since I graced the stage of the Lostpedia Blog, due to a myriad of reasons but mainly work commitments and the inherent lack of an ARG to force me into finding the time (LOST ARGs having always been "my thing"). But hopefully next week might resolve my issue as we head toward the big summer event in the LOST fan calendar - Comic-Con!!!! Comic Con has always held a special place in our hearts, and particularly here at the LP Blog where last year's coverage was a huge hit, and really caused a snowball effect that led to the start of some great investigative segments, as well as the fan following that naturally matured in response. Covering the goings on from afar, I remember the excitement and craziness we all felt, and though maybe it can't compare to an episode of LOST... in some ways it CAN because of the complete unknown it entails. There are no spoilers out there cluing us to the possible developments we might see over the course of the hiatus. Likewise, there is no real agenda being pushed by the marketing team or production crew at the panel, other than to simply get the fans pumped about the show. It is an ABC-unadulterated treat just for the fans' pleasure, and there is undeniably something a little magic about that. What's great to see is that the message of this year's show is really on the fans, and deservedly so we say. 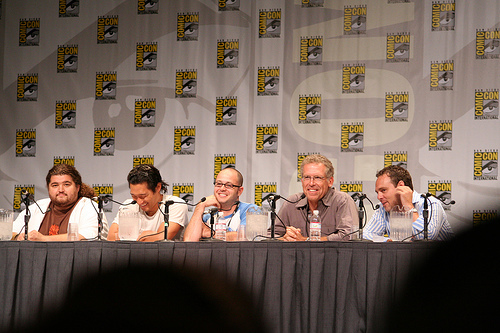 Even though you might think "well duh, it always was", considering this is the last LOST panel EVER, there is a certain something in the air making us feel that this show is going to be an absolute riot for those who love LOST dearly. This summer is also really the last chance for another LOST ARG, and one has to wonder will the writers develop another filler for us, nothing at all, or will they step it up like they did with the Lost Experience? With the theme of this year's panel definitely on giving back to the fans, it seems likely that the surprises in store will indeed be the best yet. What do you think will happen this year surprise wise? Do you think a new summer ARG could be in the offing? Check back next week for more pre-event posts, and make sure to follow the Blog and the Lostpedia Twitter account during and after Comic Con for all the gossip and revelations coming from San Diego!